Point Cartwright Lighthouse | Lighthouses of Australia Inc. The Point Cartwright Lighthouse is the third light to guide ships into Moreton Bay since 1897. The technology of the light is far removed from the original oil lamp and reflector of last century. The first lighthouse was established at Caloundra in 1896 and was the typical Queensland tower; a timber frame with metal cladding. In 1967, a new signal tower and lighthouse was erected for the Caloundra Harbour was erected next to the old lighthouse on Canberra Terrace. Because the second lighthouse was becoming obscured by high-rise development it was decided to build a new light on the coast to guide ships approaching the NW channel to Moreton Bay from the North. The existing light would be turned over to the Queensland Department of Harbours and Marine to serve as a harbour light. 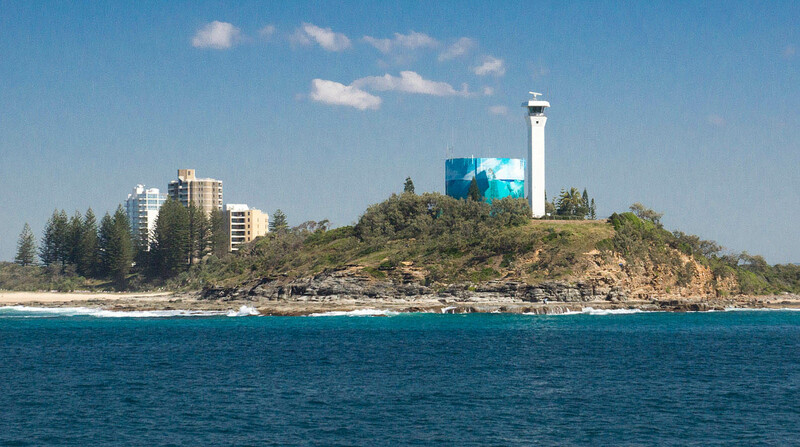 The third lighthouse was erected in 1978 on the mouth of the Mooloolaba River at Point Cartwright 14 kilometres north of the old lights at Caloundra. It was constructed of reinforced concrete surmounted by a precast concrete lantern room. The light departed from the traditional light source and lens. It is powered by an array of sealed beam lamps. A red sector provides guidance to the North West for vessels entering Mooloolaba Harbour. The light is unmanned and only requires servicing once every four months. 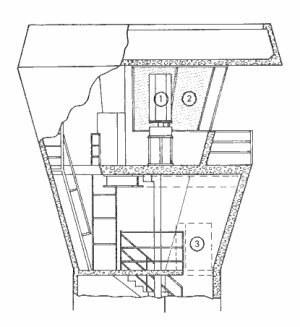 Diagram Left:(1) The lantern room optics comprises a revolving hexagonal column of sealed beam lamps arranged in two banks – a main bank and an emergency bank. (2) A red sector, using a filter and a red Plexiglas screen provides a low intensity red light to the North West for vessels entering Mooloolaba Harbour. (3) The switchboard controlling the supply of power from mains, diesel standby and battery banks.